For 23 minutes of Friday night’s Odessa-Holden game the two teams were locked in what appeared would be an entertaining, down-to-the-wire finish. Instead, the Bulldogs snatched the momentum with an interception and short touchdown drive in the final minute of the half, taking a 13-6 lead before erupting in the third quarter on their way to a 36-6 victory. Trailing just 7-6 at that point, Holden had good field position with 59 seconds left before the half, starting its drive on the Odessa 45. But on the first play of the drive, Calieb Bennett picked off a Nick Martin pass and returned it 50 yards to the Holden 17. Three plays later, Bennett found the end zone on a 17-yard pass from Jake Bartow. “That turned the momentum going into the half,” Bennett said. The third quarter was all Bulldogs. On Holden’s second drive of the half, head coach Mike Hedrick called for a fake punt despite being on his own 24-yard line. The play was quickly snuffed out by the Bulldogs which led to a short field, and while they needed six plays to go just 18 yards, Bartow found Colby Nickels on an 8-yard slant to make it 20-6. The mistakes piled up from there for the Eagles. On their ensuing drive, after a three-and-out, a bad snap on the punt gave the Bulldogs excellent field position once again. This time they needed just one play to take advantage, as Mason Smith scampered in for an 18-yard touchdown run. Another three-and-out and another bad snap on the next Holden drive led to a safety after the snap sailed over the punters head, which he landed on in the end zone. After the subsequent free kick, five plays and 48 yards later, Bartow ran it in from 1 yard out and just like that, less than a minute into the fourth quarter, Odessa had a 36-6 lead. “We capitalized on our stops,” Bennett said. Bartow finished with a strong performance, throwing for three scores – the first of the game also went to Bennett – and running the last one in. The Bulldogs’ own defense wasn’t too bad itself, slowing down Holden standout tailback Austin Tevis by holding him to fewer than 100 yards for the game. Tevis and Holden will look to get back on track next week at Lexington after falling to 2-2. 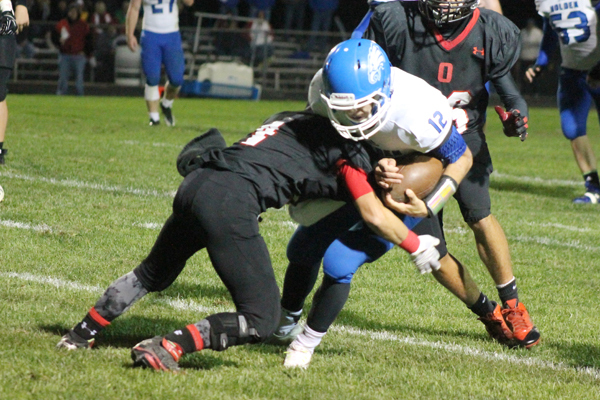 Odessa, now 4-0, will be riding high heading into next week’s showdown with Class 3 ninth-ranked Oak Grove.